The fixed ClimaCheck Performance Analyser provides non-invasive monitoring of temperature/pressure/power meter connections for ACR & HP systems and delivers live reporting and alerts 24/7. Lease your fixed unit from ONLY £95 per month! The real potential with having ClimaCheck as part of your tool kit, is the system optimisation possibilities. Our experience shows that ClimaCheck can save up to 30% of ACR energy costs. Fri3Oil works with any type of refrigerant and can be used on any type / size of refrigeration or air conditioning system. Fri3Oil is thus ideal for refrigerant/oil conversions (retrofits of MO/POE Oil) or the removal of all contaminants following a compressor motor burnout. The Fri3Oil system is available to hire or buy from Business Edge together with a full flushing and recovery service from our experienced team. 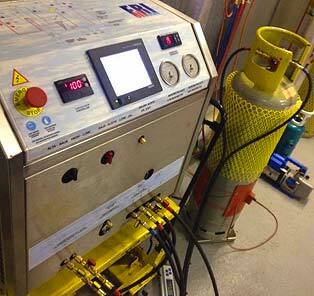 Read more about the Fri3Oil Refrigerant Recovery Machine here.